Having looked at various articles after the death of Kim Jong-Il, I started to reflect upon the Korean friends who identified with North Korea in Japan and the few North Korean people that I knew personally. Of course, their opinions could not be anymore diverse because of the different backgrounds they had come from or the different perspectives that they held. Also, the relationship that my Korean friends in Japan had to North Korea is very different from the students who had actually been born in North Korea and escaped while they were still so young. While I researched the Korean minority in Japan last summer before my internship with the Ministry of Unification, I had the opportunity to interview a few people who had visited North Korea while they were high school students. 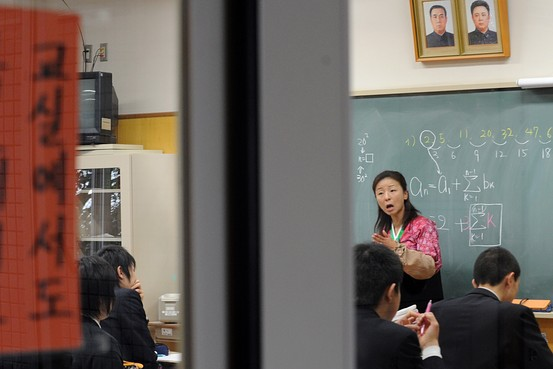 Until North Korean education schools in Japan had started to request more government support from the Japanese government, the classrooms had featured pictures of the two Kim leaders as a regulation declared by North Korean administration who had in the past received visits from teachers who would report on the progress of the children’s education. Therefore, I had asked my interviewees about their thoughts on Kim Il-Sung and Kim Jong-Il. One of the two interviewees who had visited Pyongyang had said that when she had visited North Korea as a child she immediately realized that the glorified images portrayed in her history books did not give an accurate picture of life in North Korea. From that moment, she no longer revered the two Kim leaders as she had been taught to as a student in the North Korean educational system. After that point in time, she took pride in her ethnic identity as a Korean woman, but no longer held on to her allegiance to the North Korean schools and government. My second interviewee had a completely different experience. She admitted to me that she might have been very naïve as a child. She had literally kissed the ground almost in tears when she first stepped onto North Korean soil – happy to have finally made it to what she had considered her homeland when she was younger. She also admitted that she cried when Kim Il-Sung died in 1994 even though she had not lived in North Korea – she had believed in the power of his message sincerely at that time. Although her opinions about North Korea and its political system have changed over time, at a point in her life she did believe in Juche and in her identity as a North Korean national. So I think it is possible for the tears of the North Korean people to be equally real unless her tears as a child were made more genuine by her innocence. During the time that I had volunteered at Hangyeore, no one had ever brought up Kim Il-Sung or Kim Jong-Il. I am not sure if it was because they had not come from Pyongyang, so the Kim leaders were a little less prominent in their daily lives or if it was because they did not care to talk about them either because of judgment from South Koreans or anger toward the system that deprived them. I imagine that life away from North Korea has decreased their reverence of their former leaders had they ever had any allegiance to them. But once again, I suppose that for now the opinions or state of mind of the actual North Korean people will remain a mystery to us until unification can break down the barriers to freedom of expression in North Korea. This entry was posted in Articles and tagged Diana, Hangyeorae, Hangyeore, Hangyuhrae, internship, Japan, kim ilsung, Kim Jong Il, Linton, ministry of unification, north korea, pyongyang, school, students, unification by MOUonekorea. Bookmark the permalink.